In four years at the University of Central Florida, Matt DiFebo helped the football fan base grow to more than 23,000 season tickets at its peak in 2007 and generate an additional $4.5 million a year in ticket revenue and $3 million in fundraising dollars. 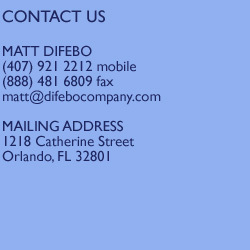 DiFebo has now started his own consulting firm, assisting college athletic departments with his ticket sales model, emphasizing customer service and personalized attention. Staff writer Theresa Manahan spoke with DiFebo. New title: Principal and owner of The DiFebo Co. Explain your sales model and how it is unique. The proactive year-round ticket sales model is, in itself, a revolutionary concept in college athletics. Prior to working at UCF, my core career experience was in professional sports, thus my ticket sales model incorporates many of the same sales fundamentals, but in the past 4 1/2 years, I have been able to mold and create a ticket sales model that addresses the unique conditions presented by the collegiate environment. Is there something about the model that makes it more attractive to colleges rather than pro sports? Our model is especially attractive to colleges because it is designed to operate efficiently while maximizing revenue for an organization that does not have the same resources as a professional sports organization. Can social media be used to generate revenue? It ties into a good advertising and marketing plan, especially for the audience that we’re targeting: a lot of young alumni or current students. Do you believe in dynamic/incremental ticket pricing? Does your model embrace this? Certainly in these economic times, I think most universities should look at this and consider it. Your company claims to offer innovative technologies not yet widely adopted. What are they? We have some strategic alliances that will allow us to introduce cutting-edge technologies and telephony solutions to our industry. Technologies like Interactive Voice Response, VoIP and automated telephone campaigns that can be utilized for renewal campaigns, acquisition or customer service initiatives. What will be the biggest challenge for your new company? Like any startup business, the challenge is to get the word out to prospective clients. What is your biggest professional disappointment? Not being drafted in the first round by the Philadelphia Phillies. They must have overlooked my baseball prowess. What is the one element you would like to see changed about the sports industry? I would like to see more college athletic departments become self-sustaining to avoid cutting programs. The best part about intercollegiate athletics is the well-being of the student athlete.